In July 2015 Pope Francis tweeted: “The most powerful witness to marriage is the exemplary lives of Christian spouses.” No doubt this is true. In fact, this conviction—that we have much to learn about both marriage and holiness from married couples themselves—motivated a colleague, Julie Donovan Massey, and me to embark on a recently completed research project that resulted in the book Project Holiness: Marriage as a Workshop for Everyday Saints. We wanted to hear from (extra)ordinary folks in the pews about how their faith influences their marriage and how their marriage affects their faith, believing these married couples to be rich and largely untapped theological resources. In other words, we wanted to gain wisdom from the “powerful witness” of their “exemplary lives” in order to pass that wisdom along to others. We began with written surveys in 20 parishes and subsequently conducted face-to-face interviews with 50 couples who had been named as “models of holiness” in those surveys. Through the testimony of these couples who are faithfully living out the vocation of marriage (we call them everyday saints), we learned about the virtues, values and practices that contribute to a flourishing marriage and to the holiness of spouses. These couples offer hope in a culture in which many despair about the state of marriage. We wring our hands that fewer young people are choosing to marry. Despite ebbs and flows, divorce rates continue to be surprisingly high decades after our country’s so-called divorce revolution in the 1960s. Further, we witness and lament distorted notions of marriage. For example, our culture’s overly romantic, overly gendered “soul mate” model of marriage dominates, beginning in the toddler years. (Thanks, Disney!) As a result, many view marriage as primarily about romance and self-fulfillment, a fragile model of marriage with little chance of enduring the inevitable challenges and hardships that beset even the strongest married relationships. With so much bad news about marriage, we desperately need the good news offered by the couples in our study, who model friendship and fidelity over the long haul and who powerfully show that marriage is, indeed, a fruitful vocation that makes one holy and virtuous. Rooted in the testimony of the couples in our study, I suggest that—in order to flourish—married couples should foster friendship, practice mercy and fidelity and seek community. The word friend is tossed around casually in our culture—befriending (or de-friending) a person is simply a click away on Facebook. In contrast, authentic friendship is lasting and morally demanding. It results in the development of character. Ultimately, our friends should make us better because they want what is best for us and they do what is best for us. A true friend helps us to live up to our potential as human beings and, from a Christian perspective, become closer to God. The married relationships we encountered reflect this deep kind of friendship. Married friends also help one another to grow by consistently supporting and encouraging one another, naming and celebrating each other’s gifts and replenishing emotional reserves. Many times spouses are trusted conversation partners and cheerleaders, rightly reminding their partners of their many positive attributes. At other times spouses must do the dirtier work of intimacy, pointing out negative behavior and tendencies in their partner that rightly should change. The couples in our study truly inspired us by the many ways they serve as mirrors of God’s love, extending mercy to their neighbors. Couples provide hospitality to folks in need: a brother with significant disabilities; a child from the foster care system; a young, single and pregnant niece; the friend of a son who had been kicked out of his dysfunctional home, and the list goes on. Sometimes, a stay that was expected to be temporary turned into a lifetime commitment. Always, hospitality demanded adjustment and sacrifice. Couples engage in forms of organized service—working at local food pantries, building homes for persons who are homeless and participating in mission trips here and abroad. Couples also care for neighbors in less formal but no less meaningful ways—by grocery shopping or shoveling snow for an elderly neighbor, making rejected L.G.B.T. youth feel welcome in their home or feeding neighborhood kids who seem to regularly arrive at mealtime. Couples were frank when admitting that practicing mercy over an extended period of time can feel inconvenient, even burdensome, and therefore it must be linked to faith and fidelity. Bob’s conviction that his redemption is somehow tied to the mercy and hospitality he shows this man makes sense in light of the parable of the Last Judgment. Bob is living out the Gospel demand to welcome the stranger, which is how one inherits the kingdom. The young man he mentors is a stranger in the strictest sense of the word—disenfranchised and devoid of community. Despite the challenges of this relationship, which are many, Bob and Jeanne continue to practice hospitality and show fidelity because they believe God calls them to do so. As noted above, our research took place in Catholic parishes. Perhaps it is not surprising that couples often emphasized the value of active participation in a church community as they pursue married friendship. 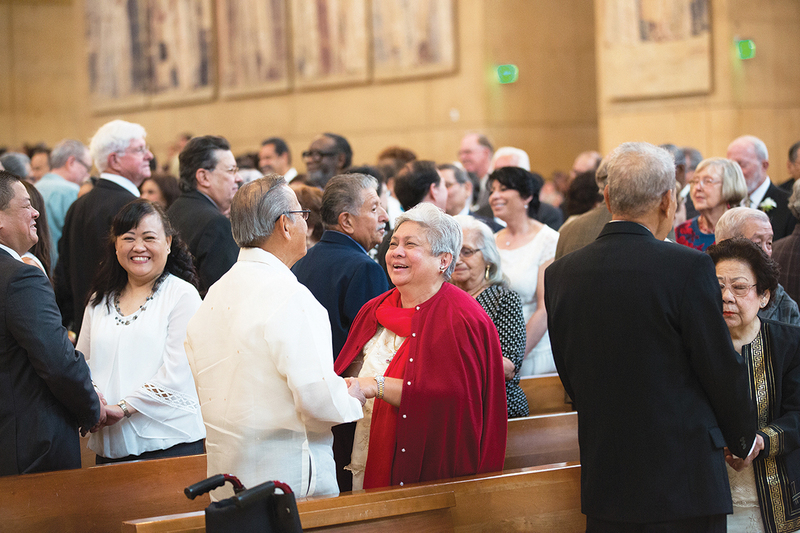 They described the regular celebration of Mass as a kind of “compass-setting” that reminds them of what is important, and as a joyful gathering of church “family” that provides modeling and support as they try to practice the Christian way of life. In their churches, they find support in suffering as well as opportunities to reach out and care for neighbors. The meetings of the Synod of Bishops on the family and the World Meeting of Families are now over, but we must continue to find ways to honor, celebrate and learn from the everyday, married saints among us. Their profound holiness is good news, indeed. Unfortunately, the recent synod had little to say about the joys and graces of marriage. To do so would challenge the church's preoccupation with celibacy as the true mark of sainthood. Until we regain genuine praise and respect for the millions of faithful to each other couples and begin to celebrate their love and contributions to the church and society, they will continue to be kept in a form of solitary confinement. Despite its proclamations to the contrary, the church remains afraid of marriage and real physical love. It's nice to see someone studying marriage by talking to married couples! We need more wisdom from the lived experience of the laity. Marriage is spiritual formation. We recognize the change that people undergo in marriage because we give people different names when they are married. They are a husband or a wife instead of being a bachelor or a maiden. We also acknowledge that the end of the marriage matters - a widow or widower is not the same as someone whose marriage ended in divorce. The church condemns sexuality, often even in the context of marriage, and elevates virginity/celibacy in a way that Jesus does not. The likely reason that Jesus does not condemn sexuality is that sexuality will bring a person to maturity faster, more certainly and with less fuss than spirituality. Sexuality moves young people out of their parents' homes and into marriages. Having children is 24/7, lifelong, irrevocable formation in selfless giving. Having children also integrates parents into the community. If you look at sexuality and spirituality closely, they are very similar. The reason the church condemns sexuality is probably because sexuality is spirituality's greatest competitor. Almost everyone worships at sexuality's altar at one time or another and without being told they must. This article also appeared in print, under the headline "The Holiness Project," in the February 15, 2016 issue. Bridget Burke Ravizza, an associate professor of theology and religious studies at St. Norbert College in De Pere, Wis., is the co-author of "Project Holiness: Marriage as a Workshop for Everyday Saints."